A lineup featuring some of rock’s biggest artists has been announced for the fifth annual Monster Energy Fort Rock, Saturday, April 29 & Sunday, April 30, 2017 at JetBlue Park in Fort Myers, Florida. 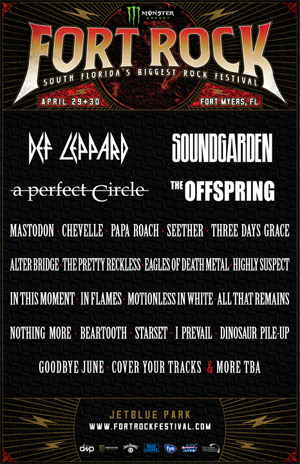 South Florida’s Biggest Rock Festival will be led by DEF LEPPARD (Saturday headliner), SOUNDGARDEN (Sunday headliner), and A PERFECT CIRCLE, and will feature performances from over 25 bands on two stages, including THE OFFSPRING, MASTODON, CHEVELLE, SEETHER, PAPA ROACH, THREE DAYS GRACE, AALTER BRIDGE, and more. Check out the official Monster Energy Fort Rock video announcement below.